Purchase this product now and earn 3,990 Points! Fits Canopies Up To: 5-1/2 in. Difference between low luster and gloss finish sheen, view here. Would you like us to drill the center hole? It’s Free! (I understand this item is non-returnable). 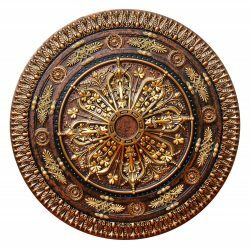 If your light fixture, chandelier or ceiling fan is already installed and you don’t want to remove it, you have the option of buying this ceiling medallion in two pieces. 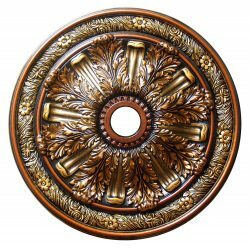 This ceiling medallion is fully hand painted by a professional artist. Finished in metallic colors to match chandeliers, lights fixture and ceiling fans. This medallion is made of polyurethane that last forever. As this is a custom hand painted product, please allow 7 to 10 business days for shipping. 1 – 10 Medallions: 7 – 10 days. 10 – 50 Medallions: 15 – 21 days. 100 + Medallions: 1 – 2 Months. 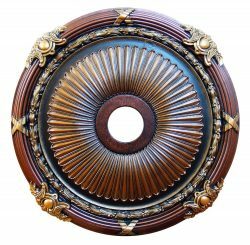 Some of our ceiling medallions come with no center hole from factory, we offer the service of drilling the hole for free (please be advise that item can not be returned), Just measure your electric box or installation place and choose center hole size for your medallion on product options, we will cut it for you. 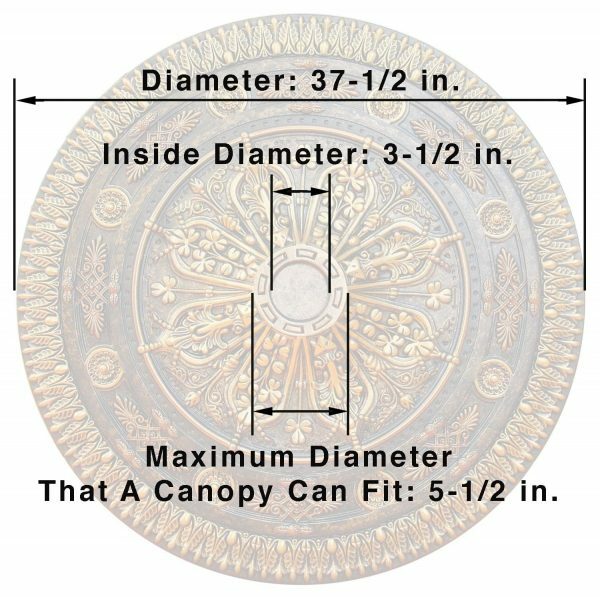 In most of the ceiling medallions, the design close to the center area allows to place a canopy wider than the inside diameter that comes from factory, That’s the maximum diameter that a canopy can fit (view product specifications), a small design area around the center hole might be covered but you save the canopy (recommended). Other option is to replace your canopy for a smaller one that fits the inside diameter (only if your canopy is bigger than inside diameter. Solid urethane for maximum durability and detail. Lightweight for quick and easy installation. 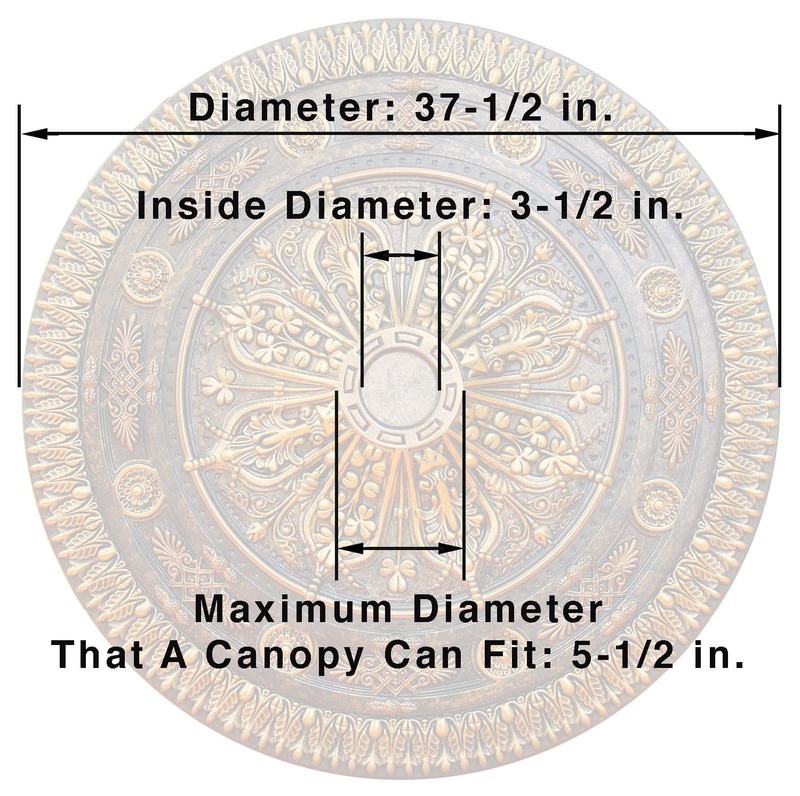 Important: If your Ceiling Medallion comes with no hole from factory, it should be cut prior installation, just choose the appropiate diameter of the hole you need to cut according your electric box size and the canopy of your ceiling fan or light fixture, also check the medallion specifications (center hole diameter and maximum that a canopy can fit) provided in the product page tabs. You can use a regular hole saw tool available in any local store to cut the medallion. · Sponge or clean cloth. · Hammer & finishing nails (Nails must be long enough to penetrate the substrate at least 1/2″). · Jigsaw, keyhole saw, or pen‐knife. · Clean installation surface and back of medallion of all dirt and dust with a clean cloth or sponge. 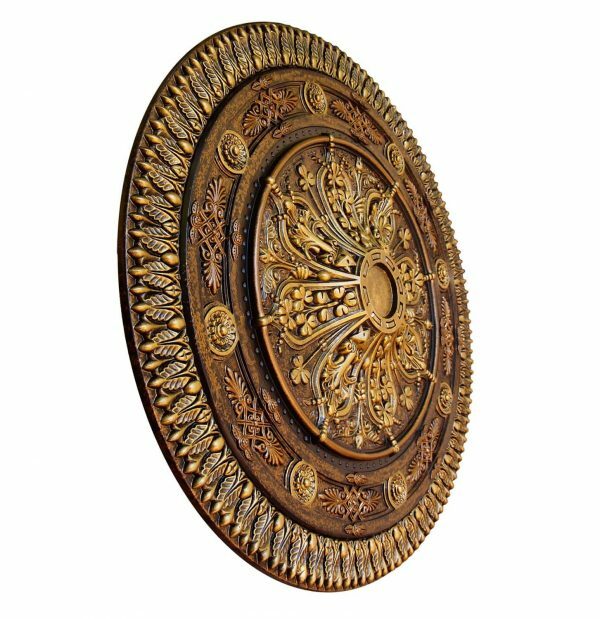 · Make sure that the surface and the back of the medallion are completely dry before attempting installation. · Measure and mark the location where the medallion is going to be installed. · Make sure to use the correct tools recommended. · Follow fixture, power tools, and paint manufacturers’ instructions and users manuals. · Use common sense and follow good construction practices. · Medallions are not load‐bearing. Do not use them to support electrical fixtures or ceiling fans. · Turn the power off at the breaker before installation. 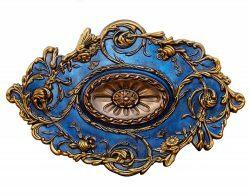 · Medallions are solely decorative. 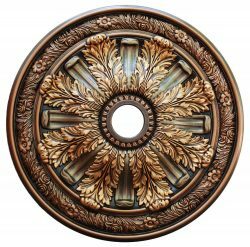 Do not use medallions to support the light fixture or fan. 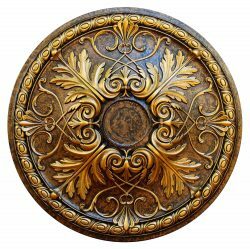 · Do not use the fixture or fixture canopy to support the medallion. · Make sure you are installing the light fixture or ceiling fan according to the manufacturer’s guidelines. If their installation guidelines conflict with our medallion installation instructions, be sure to contact us immediately. · To ensure all electrical codes are met, make sure to consult with a licensed electrician. Disconnect and remove current fixture before installing the medallion (if a current fixture is already installed). Measure the fixture canopy. Drill/cut a hole in the center of the medallion that is no larger than the canopy size (this is the hole that the electrical will go through). 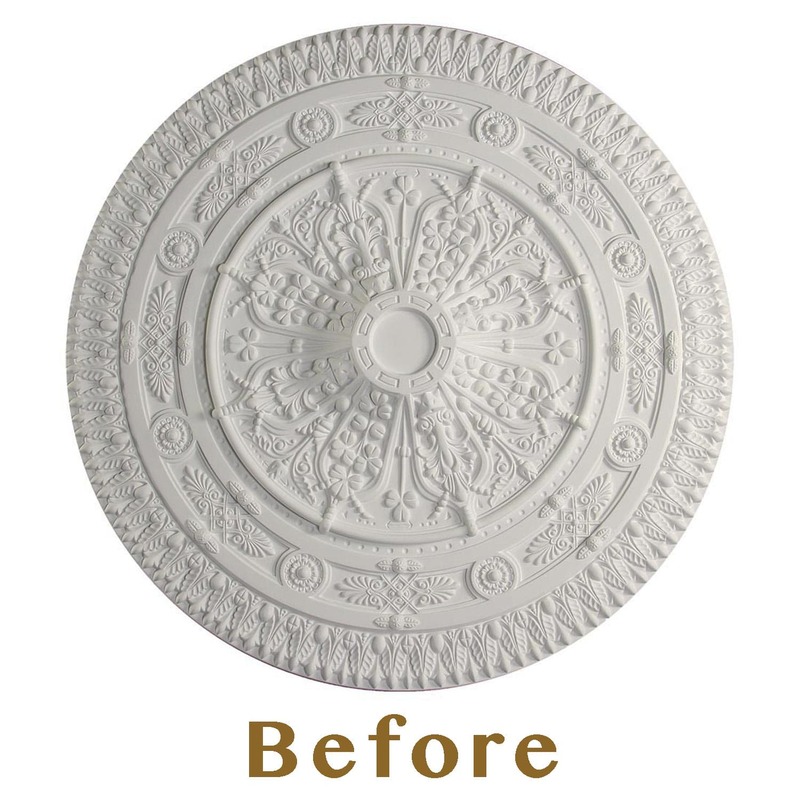 Lay the medallion face down on a soft surface that will not scratch/dent the medallion detail. Apply a 1/2″ bead of adhesive caulk all the way around the back edge of the medallion. Feed the electrical wiring through the medallion’s center hole and gently press the medallion up against the ceiling. When pressing the medallion up against the ceiling, some adhesive caulk will seep out. Smooth excess caulk around the medallion with a finger or the putty knife and apply extra caulk that is needed to fill in any gaps. Wipe off any excess adhesive caulk with a sponge or damp rag. 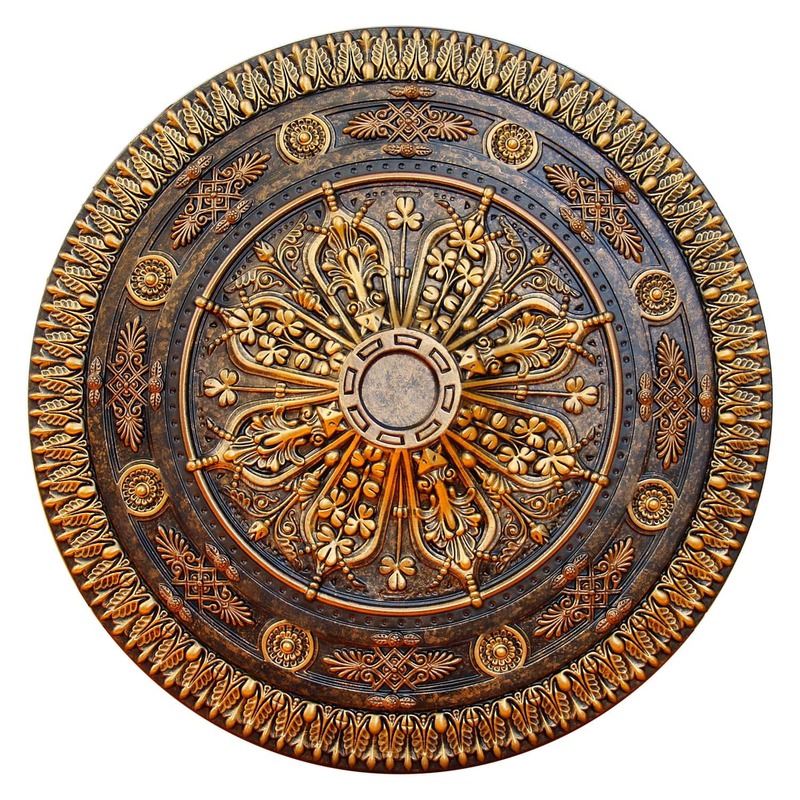 Larger medallions will need to be installed with nails in addition to the adhesive. Note: If you would like to remove the nails after the adhesive sets, leave at least 1/2″ of the nail sticking out from the medallion, so you can easily pull it out. Fill any nail holes with caulk and smooth the surface with a finger or the putty knife. If any excess caulk is left, let it dry, and then lightly sand it down with extra fine sand paper. Re‐connect the ceiling fixture or ceiling fan following the manufacturer’s guidelines. Slide fixture canopy up to medallion and tighten. Make sure it fits snugly against the medallion. 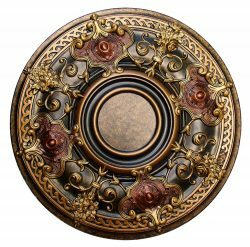 Touch up the medallion with any paint that is needed. Feed the electrical wiring through the medallion’s center hole. Countersink nails using nail set and fill any holes with caulking. Smooth the caulk with your finger or putty knife. Once the caulk is dry, lightly sand it smooth if needed. OPTIONAL: Apply latex caulk around the edge of the medallion, blending the medallion into the ceiling (this will make removal slightly more difficult). Re‐connect the light fixture or fan according the manufacturer’s guidelines. Gently press the medallion up against the ceiling or wall. When pressing the medallion up against the ceiling or wall, some adhesive caulk will seep out. Smooth excess caulk around the medallion with a finger or the putty knife and apply extra caulk that is needed to fill in any gaps. We trust you will be satisfied with your purchase of this Fine Art Deco ceiling medallion. However if you are not satisfied with your purchased item, you may return it within 30 days of your purchase date. Please place medallion in the original package with original plastic, bubble wrap, peanuts or any other protection that was contained in the package at the moment of delivery. 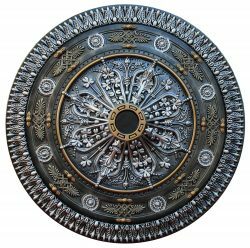 We don’t charge for restocking fees, nevertheless we cannot cover your return shipping cost, ceiling medallions boxes are subject to expensive shipping cost charged by carriers due to it’s sizes. In order to issue a refund (excluding shipping cost paid at the moment of purchase) the item should be received in resalable conditions, in case of only minor tear or scratches a discounted refund may apply, otherwise bigger damages will incur in NO REFUND issued. We will thank your understanding. 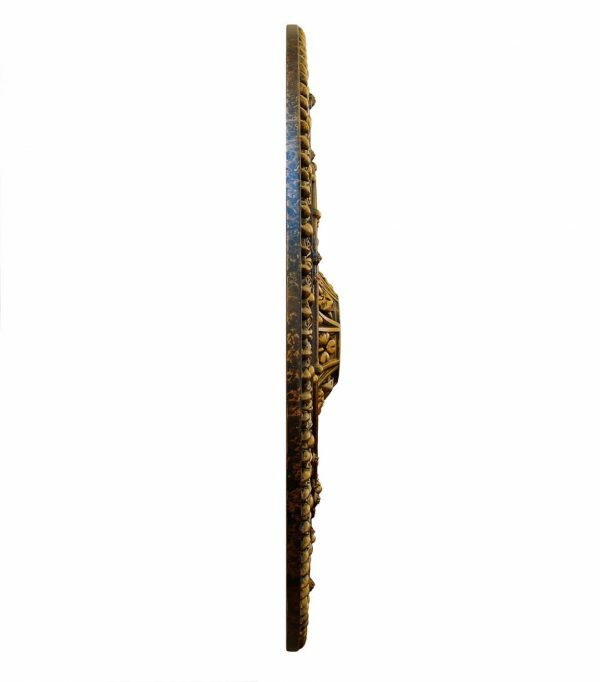 If you are not sure about purchasing this product, we recommend you to buy a sample in crown moldings sample page, for you as a customer to view our quality finishes, this will help to avoid unnecessary returns. 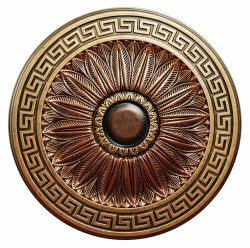 Medallions with center hole drilled by choice are non-returnable.